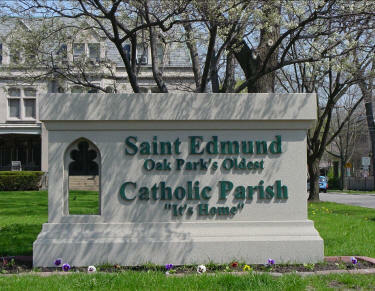 The St. Edmund Parish Website presents information and news about St. Edmund Parish, the first Roman Catholic Parish in Oak Park. The people of St. Edmund Parish are a diverse community of Christians whose beliefs are rooted in sacred scripture and the traditions of the Catholic faith. We strive to fulfill the commandments of Jesus to love God with all our heart, with all our soul, with all our mind, and with all our strength (Mk 12:30), and to love one another as He has loved us (Jn 13:34). We gather as community to be nourished in Word and Sacrament, and are sent forth to be, to see and to experience Christ in the world with friend and stranger alike. In gratitude for all our blessings, we commit ourselves to love, forgive and support each other joyfully. We seek to serve others and to be active participants in living our Catholic faith. Attend Daily Mass. Join us every Monday-Friday at 8:30am. Centering Prayer every Saturday at 9:30am. All are welcome—beginners too! Come join us. Sacrament of Reconciliation Saturdays: 4:15pm. (located in west end of north transept). We Need the Generosity of Every Parishioner! The easiest and most convenient way to remember your weekly collection is to sign up for automatic electronic withdrawal. It is a very safe method of support and helps the parish know exactly what it can count on from week to week. Additionally, there are many people who do not financially support their parish at all, and we need the help of everyone! Please consider what you are able to give and sign up for automatic electronic withdrawal today! Click here to sign up through the Give Central website. MANNA Gift Cards Available for Purchase. A wide-variety of vendor cards, such as Jewel, Best Buy, CVS, Pete's Market, gas, restaurant offerings, and many more are available. You will receive the full value (100 percent) of your purchase card. St. Edmund will receive a rebate back from your purchase. MANNA ordering forms are available on the tables in the Murphy Hall corridor. Feel free to take one home with you to browse through for your shopping needs. Contact Deacon Tom at tdwyer@stedmund.org or Denise Walsh at drwalsh34@gmail.com for ordering and more information about the bank account option. Saint Edmund parishioners are strongly urged to subscribe to the Parish Listserv. Send an email using the address you wish to use to receive posts addressed to the following address: imailsrv@stedmund.org. Leave the subject line empty and write the following in the body of the e-mail: Subscribe stedmund <your name as you wish to see it displayed>. Except for your name, the command is case sensitive. Monthly Wedding Anniversary Sunday is held at all masses on the first Sunday of the month. A special blessing is bestowed on all couples who will celebrate their anniversary in that month. ... Local Area Jesuit Priests Seek Cook. Fr. Jack O’Callaghan’s S.J., community of five Jesuits in Oak Park are looking for a paid cook to prepare dinner four evenings a week, Monday through Thursday. Meals may be prepared at the cook’s home and brought to the community located across from Gwendolyn Brooks Middle School. Please contact Fr. Mark Henninger, S.J. at mhenninger@jesuits.org of call him at 202-380-7098. for further information. ... Catholic New World is a newspaper of the Archdiocese of Chicago and is available to you at no cost at the entrances of the church doors. Feel free to take a copy home and catch up with all of the news in the Archdiocese of Chicago. ... Spring Bible Study begins the first Friday after Ash Wednesday. ...The Children’s School, now in St. Edmund’s s chool building, is an independent, K-8 school with approximately 100 students. The curriculum emphasizes project based learning, social emotional competence, and social justice teaching and learning. The school is pleased to be our neighbor and welcomes us to visit the school. Their website is: thechildrensschool.info; call 708-484-8033 to learn more or set up a tour. ...we’re on Twitter! Follow us: St. Edmunds-Oak Park or click on @edmunds_oakpark . This web site was the inspiration of parishioner Suzanne C. Guerin, who passed away in October, 2003. The site is lovingly dedicated to her. Our "Beyond the Building Campaign" to restore the St. Edmund Parish Rectory is underway. For weekly updates, and Fr. McGivern's message to parishioners, click on Capital Campaign. Today is Easter Sunday, April 21. 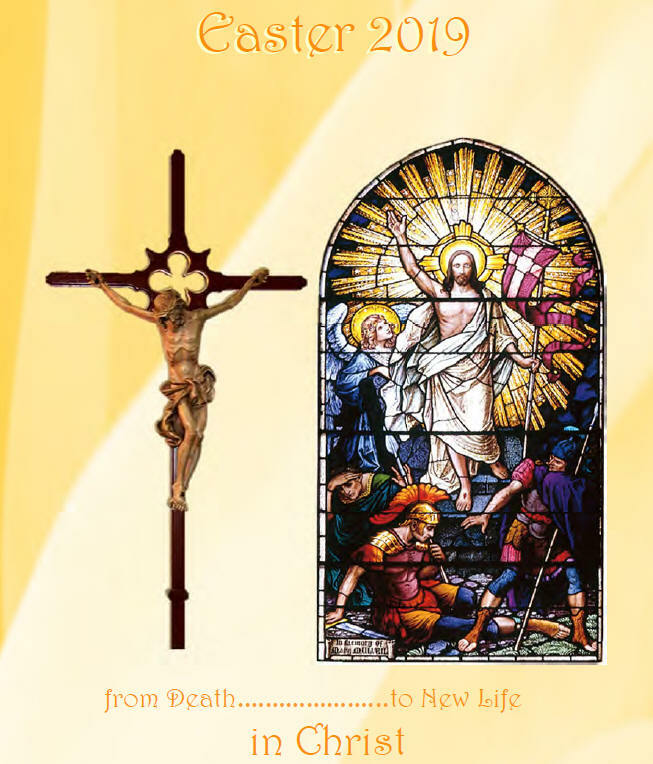 The Saturday Easter Vigil mass will be held at 7:30 pm. Masses on Easter Sunday will be held at 9:00 am and 11:00 am. Saturday, April 27, join us on the rectory lawn from 6:30 to 7pm for our Monthly Vigil to End Gun Violence. It is our way of standing against the culture of violence in our country. We also urge legislators to understand the urgency of this issue. Please join us and bring friends. Sunday, April 28, the Sunday after Easter, is Divine Mercy Sunday. On 08/03/02, the Apostolic Penitentiary announced that in order “to ensure that the faithful would observe this day with intense devotion, the supreme Pontiff himself established that this Sunday be enriched by a plenary indulgence...so that the faithful might receive...the gift of the consolation of the Holy Spirit...and after they have obtained God’s pardon, they in turn m ight be persuaded to show a prompt pardon to their brothers and sisters.” We encourage you to take advantage of this holy opportunity. The plenary indulgence is granted under the usual conditions (sacramental confession, Eucharistic communion and prayer for the intentions of the supreme Pontiff). It is required of all Catholics to confess their serious sins at least once every year. If you haven’t already met this obligation then please considering doing so now. The Church allows for one to go to Confession for up to about 20 days, before or after Divine Mercy Sunday. Please join us at our usual weekly Reconciliation time of 4:15—5pm every Saturday. If there are several individuals waiting, we will gladly stay in order that all Confessions may be heard. The image of the Divine Mercy, which Our Lord requested to be solemnly venerated on this day, will be on display in our church. St. John Paul II believed that the image portrays the Risen Jesus Christ bringing Mercy to the whole world. Saturday-Sunday, May 4-5, please Note Important Change: Catholic Charities Second Collection 1 Week Early. Although your envelopes indicate that the annual Mother’sDay Catholic Charities collection will take place the weekend of May 11/12, we kindly ask that you bring your Catholic Charities donation to church on the weekend of May 4/5, the revised date for the collection. Thank you! Thursday, May 9, please join us for our Fifth Annual Architectural Church Tour & Pilgrimage from 9:00am - 2:30pm. The bus will leave at 9am sharp from the Pleasant Street s ide of the church. We will visit the following churches: St. Anthony-All Saints, St. Mary of Perpetual Help, Nativity of Our Lord, and St. Procopius Church and Chapel. The cost for the bus tour is $15.00. The last stop will be lunch at Manny’s Deli in Chicago. You are responsible for the cost of your own lunch. Contact Don at 708-848-4417, extension 2051 to register. Space is limited, so be sure to get your registration in early! Sunday, May 19, the Sacrament of the Anointing of the Sick will take place during the 11am mass. Our Parish Green Team is initiating a Brown Paper Bag Composting Experiment for all parishioners. Click on Special Events for details. St. Edmund Parish is in need of a few good people to serve as Extraordinary Ministers of the Eucharist and Lectors for the weekend masses. The Ministers of the Eucharist assist in the distribution of Holy Communion at mass. Lectors proclaim the First and Second readings at mass, lead the people in the Prayer of the Faithful, and read the weekly announcements. For questions, contact Mary Lynn Dietsche at dietscheml@gmail.com or call the parish office. Our volunteer recruitment for the St. Edmund’s PADS Ministry continues. This ministry works under the umbrella of the housing Forw>rd + Prevail organization. The program runs every Tuesday from Mid–September through Mid-May at Oak Park Temple at 1235 North Harlem. We hope you will consider supporting this key parish ministry by signing up to be a team volunteer. As a volunteer you are making a commitment to work as part of a team in whatever capacity you choose. For more details, please click on the Special Events link. Minister of Care Home Visit Arrangements. St. Edmund Parish has trained Ministers of Care, who bring Communion to homebound parishioners. Arrangements can be scheduled on either a short-term or long-term basis. To schedule visitation, contact Peggy Leddy, Pastoral Associate, at 708-848-4417, x202, or pleddy@stedmund.org . Donate your discarded cell phones and help abused women. The Domestic Violence Outreach Ministry collects phones and chargers in collaboration with Verizon Network. The phones are programmed with emergency numbers, loaded with 3000 minutes, and distributed to abused women through various shelters. Drop off phones and accessories in the basket on the table in the Murphy Hall Corridor. We are grateful for your support! The last Saturday of each month, please join us on the rectory lawn from 6:30 to 7pm for our monthly Prayer Vigil to End Gun Violence. It is our way of standing against the culture of violence in our country. We also urge legislators to understand the urgency of this issue. Religious Instruction (Contact Peggy Leddy, Pastoral Associate, at 708-848-4417, extension 202 or email pleddy@stedmund.org. Do you want to become a Catholic, or perhaps just learn more about the Catholic faith? Registration for the Rite of Christian Initiation of Adults (RCIA) is now open and sessions start soon. For more information contact Peggy. Adult Confirmation Sessions.The Chicago Archdiocese’s Adult Confirmation Program is for those who are: 19-years-old or older, and are baptized Catholic and received First Communion. For the full class schedule and registration, contact Javier Castillo at jacastillo@archchicago.org or 312-965-2291. As part of your registration, please contact the church where you were baptized and request a newly-issued copy of your sacramental records to submit to Javier. Adult Confirmation is April 10. New or expectant parents are invited to register for Baptismal Preparation Class. For more information or to register, please contact Peggy. Beginning March 1, the Bible Study Group began a Panorama of the Old Testament. The goal is to look at the big picture so we get a better understanding of how the whole Bible fits together, and to appreciate the details more clearly. “No book in the Bible can be interpreted satisfactorily in isolation from the rest.” The Group meets in Murphy Hall from 9am until 10:30am on consecutive Fridays unless otherwise announced. Please join us whenever you are able, even if you are traveling in the Spring. Our discussions are educational and lively! All are welcome. The Tuesday Afternoon Faith Sharing Group meets the first Tuesday of each month from 1pm - 3pm. This is not a Bible Study program, but a sharing of your reflections on the scripture of the weekends and how it affects your life, thoughts, and the world around you. It is a chance to deepen your faith and to become more aware of how scripture has influenced your life. Please bring your own Bible having read the scriptures for the upcoming weekend. For more information and the location contact Kathy Halfpenny at: khalfpenny@stedmund.org or call her at 708-386-1832. Centering Prayer Group, Saturdays at 9:30 a.m. in the North Transept area of the church. Centering Prayer welcomes newcomers and provides a time and place for peace, quiet, prayer and reflection. Mother Theresa explained that “we need silence to be alone with God, to speak to Him, to ponder His words deep in our hearts.” Please join us; all are welcome. Rehearsals for the St. Edmund Parish choirs are held Wednesdays at 7:30 p.m. in the church choir loft, and you have your choice of serving in this ministry at either the 5:30pm Saturday evening mass or the 11:00am Sunday morning mass each week. For more information contact Kathy Halfpenny at: khalfpenny@stedmund.org or call her at 708-386-1832. The parish Welcome Committee ensures those who are new to our parish are warmly welcomed and have the information they need to feel a part of our community as quickly as possible. The committee seeks parishioners who are willing to greet and register new parishioners on the second weekend of each month. 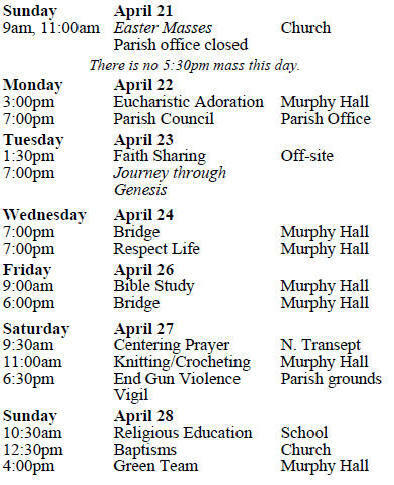 Please contact parishioner Mary Ellen Gruszka at: mgruszka8453@aol.com. Alzheimers Support Group, for caregivers of persons living with younger-onset (before age 65) dementia. The group meets on the first Saturday of every month in Murphy Hall from 10:30am - 12pm noon, unless otherwise announced. Sponsored by the Alzheimer’s Association, the group is facilitated by a trained volunteer. For more information, visit: http://www.alzheimersillinois . Caregiving may be difficult, but getting support for yourself should not be! The Type 1 Diabetes Support Group provides free, fun activities and informational presentations for families dealing with Type 1 diabetes, known as Juvenile or Insulin-Dependent Diabetes. One of the big positives is that the children and their parents meet and talk with other families with this disease. Kids also enjoy supervised play in the school gym while parents discuss diabetes related topics. Sometimes we all meet together. We meet the first Wednesday of the month in the Resource Room of the School from 7:15pm - 8:30pm, unless otherwise announced. Contact parishioner Helen Gilmore at: gilmorefamily2@comcast.net . Wednesday Night Bridge, 7:00 - 9:00 p.m., Murphy Hall. Beginners and advanced players welcome! Learn to play or improve your game. The Respect Life Committee has a virtual home at www.facebook.com/StEdmundRespectLife. “Like” our page to receive inspiration and information on current and upcoming events. The Respect Life Committee holds monthly meetings the third Tuesday of the month at 7 pm in Murphy Hall. Contact Mary Ellen Gruszka at mgruszka8453@aol.com . The parish’s Prayer Shawl Ministry ministry helps provide comfort to those who are ill, support those who are experiencing difficulty in their lives and those who are coping with the loss of a loved one. The St. Edmund Parish Life Commission offers knitting and crochet classes for adults in Murphy Hall. The group generally meets on the second Saturday of the month. "Jesus on the cross feels the whole weight of the evil, and with the force of God's love he conquers it; he defeats it with his resurrection. This is the good that Jesus does for us on the throne of the cross."